Why is there no London monument for the Blitz? The Blitz began on September 7th, 1940, seventy years ago today, when London was attacked by 300 German bombers. It lasted three months as London was bombed for 57 consecutive nights. Between September 7 and May 11, 1941, 18,800 tonnes of high explosive was dropped on Holborn, the City, Westminster, Shoreditch, Southwark and Stepney. 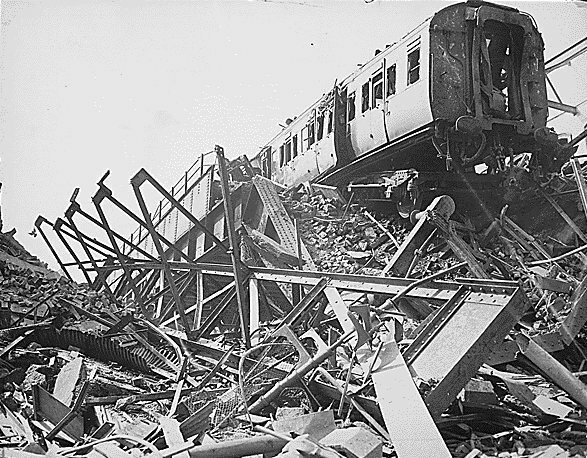 Up to 20,000 Londoners were killed, many thousands were wounded and 3.5 million houses were damaged or destroyed. And yet, astonishingly, London – a city of a thousand statues – still does not have a single worthwhile monument to the citizens who suffered the Blitz. The story of the Blitz is a familiar one – see this wonderful propaganda film for an emotional contemporary look at London under attack – and while the ‘Blitz Spirit’ narrative can be trite and over-mythologised, there was undoubtedly some truth to it. 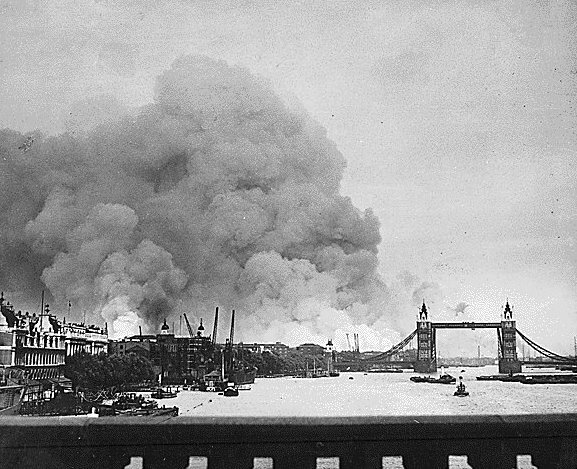 Londoners had to deal with the Blitz in part because they had no other choice, but there is evidence that Londoners did more than just survive, they almost relished the battering they received. As Humphrey Jennings wrote at the time, Londoners were ‘secretly delighted with the privilege of holding up Hitler’, while Phillip Ziegler said in ‘London At War’ that ‘Londoners made a deliberate attempt to seem nonchalant and unafraid’. Yet while London has a Monument for the Fire, it still does not properly commemorate those who experienced the Blitz. There’s a small park in Wapping, a couple of minor plaques – one by St Paul’s, near the firefighters monument, and one in St James’s Churchyard on Piccadilly – and dozens of plaques to individual explosions. But there is no single iconic statue or monument prominently placed and devoted to the citizens of London in the manner of that for, say Animals In War, or any of the numerous monuments for different branches of the armed forces (Bomber Command are the latest). This was first pointed out to me in 2006 during an interview with Jack Lohman, the Director of the Museum of London, and his museum does now contain a stunning WWII tribute. 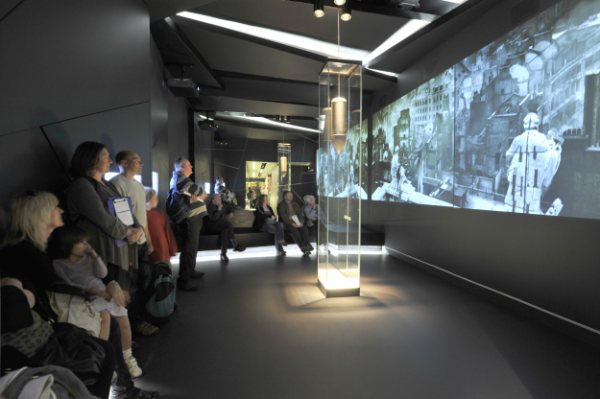 The Blitz room is a single stark shadowy space, with an unexploded bomb hanging from the ceiling. The walls show still images of the Blitz, while survivors recount their experiences on audio. It’s incredibly moving, but it isn’t enough. Why doesn’t London pay sufficient tribute to its Blitz Spirit? I asked Jane Furlong, project co-ordinator of the UK National Inventory of War Memorials, and her answer boiled down to one word: politics. Bomber Command is a ready-made community that can easily mobilise to commemorate their place in history; London’s civilians are not. Of course, that didn’t stop the Animals In War memorial from getting built, but they managed to enlist the high-profile support of patrons such as the Princess Royal, Kate Adie, Vera Lynn and Joanna Lumley. If London is to get the Blitz Spirit memorial it deserves – a dignified sculpture in a prominent public place, dedicated to all Londoners who experienced the Blitz – it requires somebody to take the initiative. And that, ironically, would chime against the spirit of the Blitz: one of exaggerated nonchalance at what took place over London in the winter of 1940-1941. So it seems for now that the sad and powerful room at the Museum of London and an easily overlooked plaque in the shadow of St Paul’s are the best we are going to get. But I think that is a great shame and that ordinary working Londoners, as Ken Livingstone might put it, deserve better.